Here at Yatzer, we just love spotting new emerging talents. 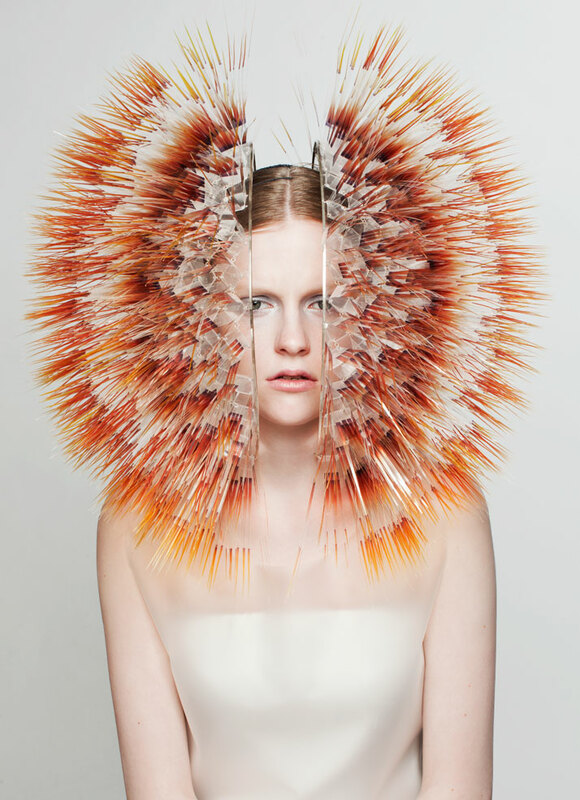 And London-based milliner and jewellery designer Maiko Takeda is certainly an up-and-coming designer to watch, having previously interned for the likes of legendary milliners Philip Treacy and Stephen Jones, as well as Japanese fashion designer Issey Miyake. After her widely publicized ‘Cinematography’ (2009-10) degree collection at Central Saint Martins which spectacularly transformed the immaterial nature of shadows into a body-adorning material, Takeda now presents her final collection of headdresses as part of the MA Millinery course at the prestigious RCA / Royal College of Art, London. LOOK7: CLEAR FILM, PERSPEX, SILVER. 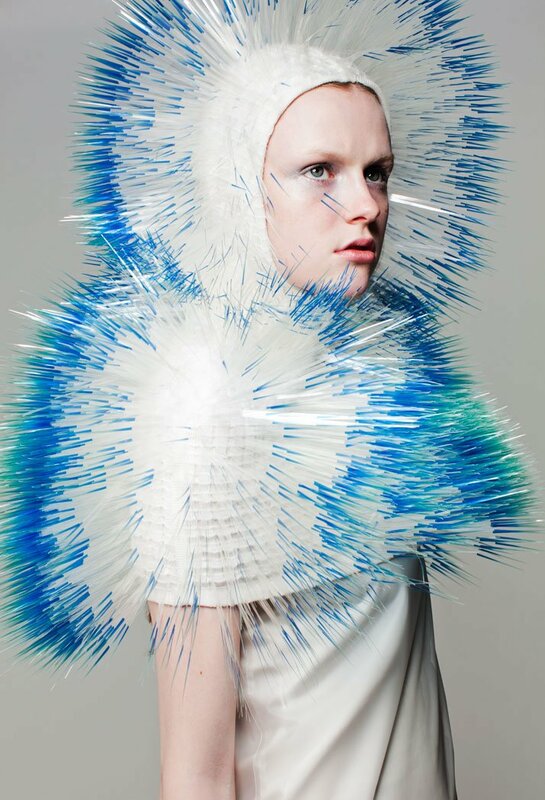 Atmospheric Reentry, MA final Collection, © Maiko Takeda, 2013. Art Direction: Samuel John Weeks, Model: Victoria Savory (STORM), Makeup: Carol Morley, Photographer: Bryan Huynh. (Garment collaboration with Louise Bennetts). LOOK5: CLEAR FILM, PERSPEX, SILVER. LOOK3: CLEAR FILM, CASHMERE WOOL (Knitwear collaboration with Nicola Jones). LOOK1: CLEAR FILM, PERSPEX, SILVER. 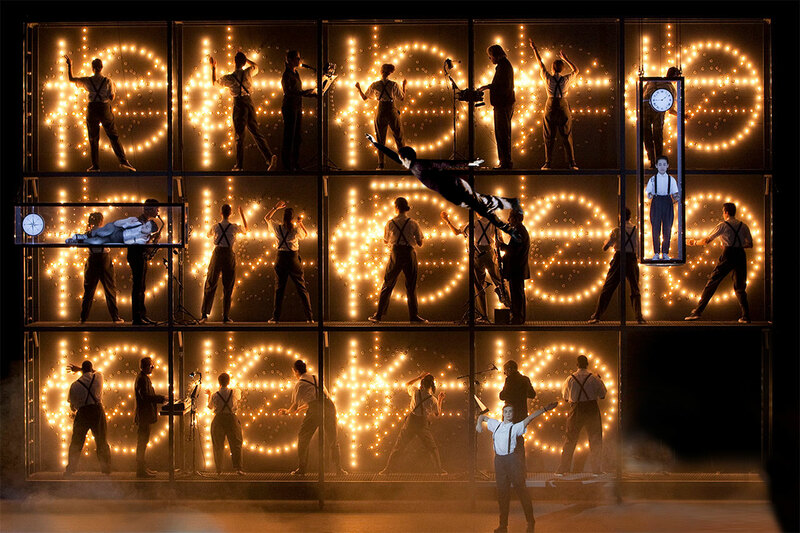 Einstein on the Beach, photo © Lucie Jansch 2012 , Pomegranate arts. 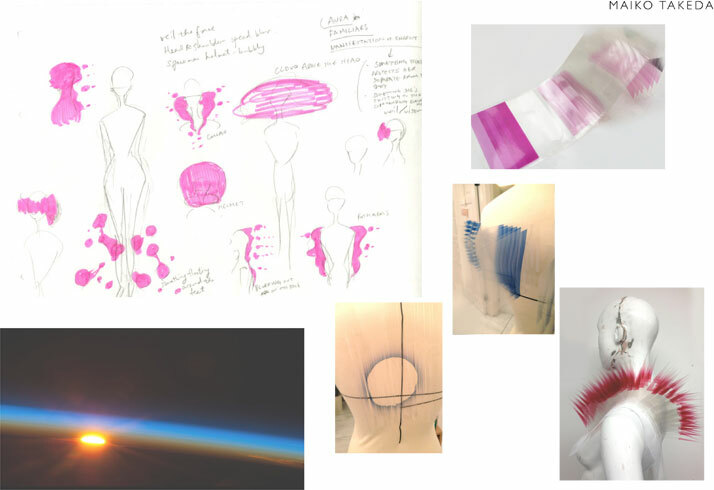 Entitled ‘Atmospheric Reentry’, the collection was presented along with another 30 MA Fashion students’ collections at the annual MA Graduate Fashion Shows 2013 last week. 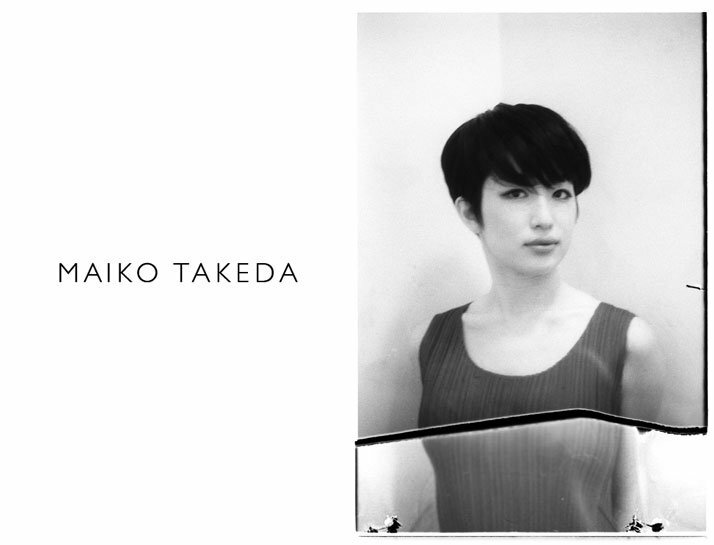 Amongst the final catwalk collections comprising menswear, womenswear, footwear, accessories and millinery design, Takeda’s collection sets out to explore, in nine show-stopping pieces, the conditions of blurring surrounding space. 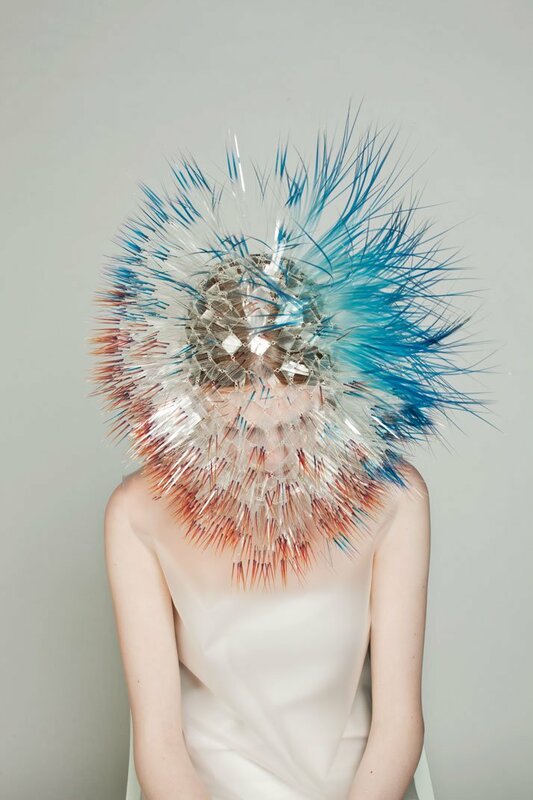 Starting from the simple question of what it would be like to enter a cloud, Maiko Takeda embarked on an experimental process to create ethereal experiences for the wearer of her creations. The aesthetic of the collection was heavily inspired by the futuristic mood of imagery taken from ‘Einstein on the Beach’, an opera written and conducted by the minimalist composer Philip Glass, and directed by Robert Wilson in 1976 - first performed at the Metropolitan Opera House in New York and the Festival d'Avignon-, which Takeda watched during its reproduction at the Barbican Theatre in London on May 2012. 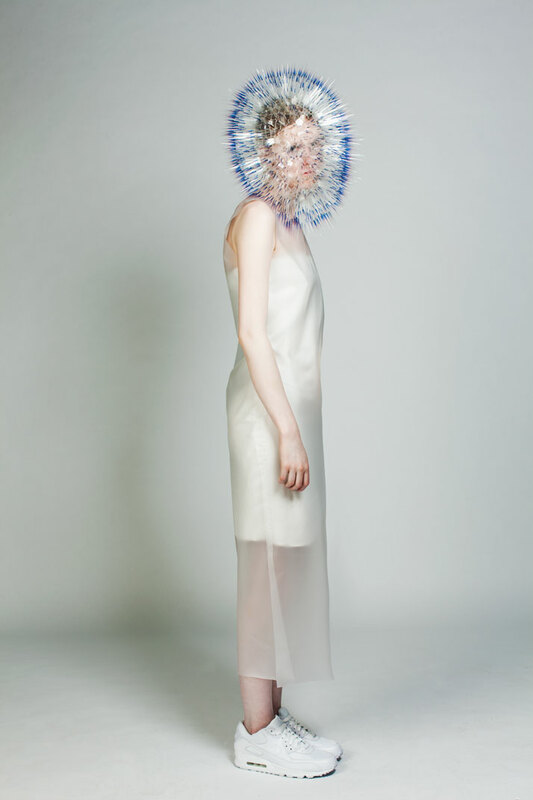 As a result, Takeda shies away from conventional hat and headpiece materials, ingeniously weaving together clear plastic film, acrylic disks and silver jump rings to create a series of otherworldly sculptural headdresses, visors and masks. 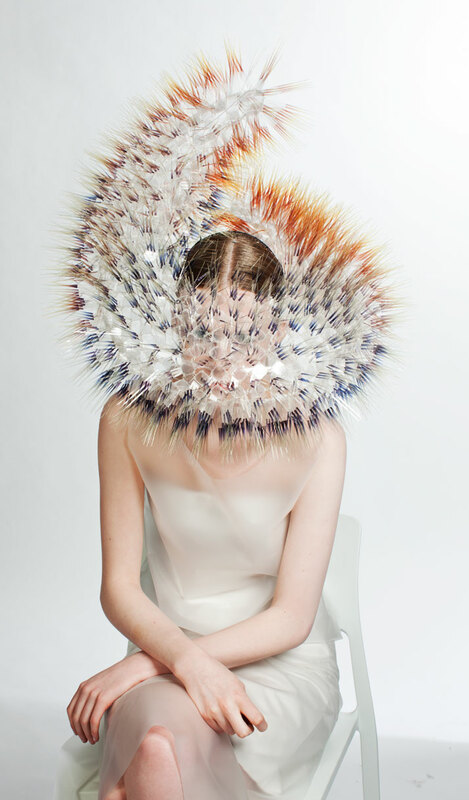 Where obsessively layered strips of colour gradient-tinted film form a wave of wafer thin spikes that fan out like artificial translucent feathers, nebulous textures and clear forms create elusive sculptural pieces that are equally dense and immaterial. 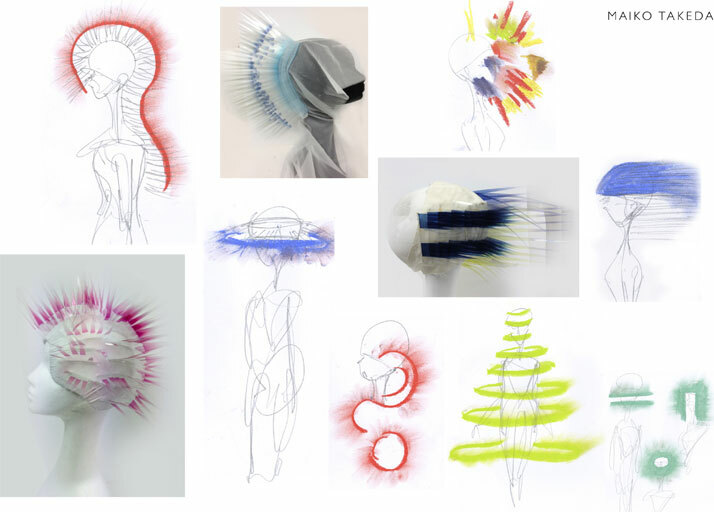 The end effects create headdresses that blur the boundaries of their surrounding space, creating an intangible aura around the body that materializes as a brightly-coloured haze. In their cloud-like form, her futuristic ruffles and new-age halos appear all at once delicate and daunting, ethereal and explosive. LOOK6: CLEAR FILM, PERSPEX, SILVER. LOOK4: CLEAR FILM, PERSPEX, SILVER. 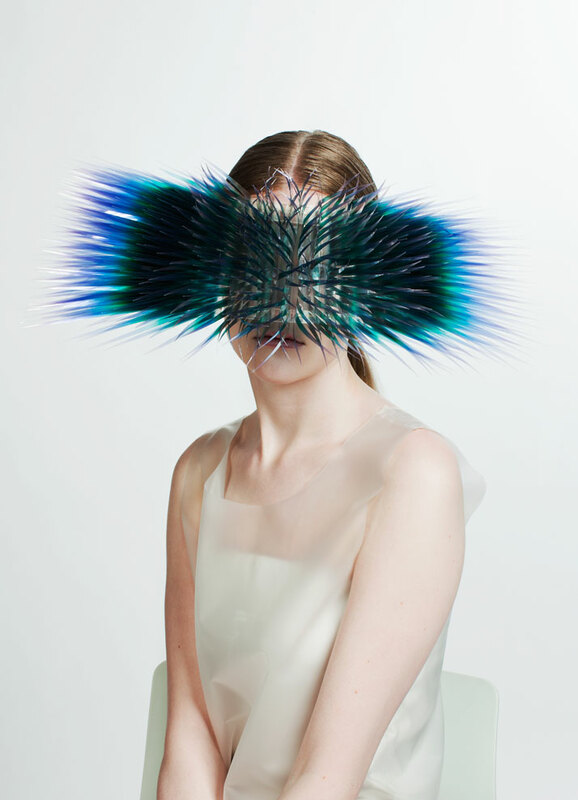 sketches & inspiration, © Maiko Takeda, 2013.
portrait of Maiko Takeda, © Maiko Takeda, 2013.